Gauri Das’s first residence was in the village known as Shaligram, not far from Muragacha. Later he moved to Ambika Kalna in Burdwan district, where his Sripat is extremely well known. His father’s name was Kamsari Mishra and his mother was Kamala Devi. Kamsari Mishra belonged to the Vatsa gotra, and their family name was Ghoshal. Gauri Das was the fourth of six sons. His three older brothers were named Damodar, Jagannath and Surya Das. Surya Das had the title sarakhela7 and gave his two daughters, Vasudha and Jahnava in marriage to Nityananda Prabhu. Gauri Das Pandit’s younger brothers were named Krishna Das Sarkhel and Nrisingha Chaitanya. Gauri Das and his disciple Hridaya Chaitanya left only a line of initiated disciples and not one of family descendants. 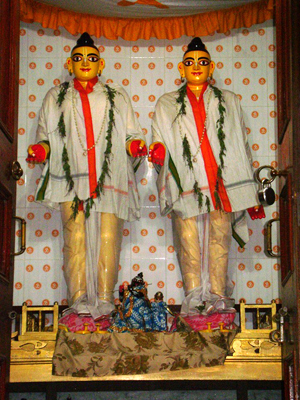 According to the Gaudiya Vaisnava Abhidhana, Gauri Das Pandit and his wife Vimalä Devi had two sons, Balaram and Raghunatha. Srila Bhaktisiddhanta Saraswati Goswami Thakur, however, did not accept the validity of this family connection. He has written as follows in his Anubhasya: “Gauri Das Pandit’s disciple was named Hriday Chaitanya. His disciple was the son of Gauri Das Pandit’s daughter Annapurna Devi, Gopiraman. It is the family descendants of this Gopiramana who are the current owners of the Ambika Sripat.” (Anubhasya to Chaitanya Charitamrita 1.11.26) The current temple at Ambika houses deities of Gauri Das, Radha-Krishna, Gaura-Nityananda, Jagannath, Balaram, and Rama-Sita. As one enters the temple grounds, there is a large tamarind tree. It is said that Mahaprabhu and Gauri Das met under this very tree. Other valuable items held in the temple are a paddle said to be used by Mahaprabhu himself and a Bhagavad-Gita said to have been handwritten by the Lord. Nityananda Prabhu made no distinctions between those who were qualified or unqualified, but simply gave Krishna prema to everyone as though intoxicated. His intimate associate, Gauri Das Pandit, similarly displayed a great power in preaching. Surya Das Sarkhel’s house and temple are also in Ambika, a little to the west of Gauri Das Pandit’s Sripat. Bhagavan Das Babaji’s ashram is also a little further west of there. A wonderful story is told about Mahaprabhu and Gauri Das Pandit in Ambika Kalna. It is said that on the day that Mahaprabhu paddled across the Ganges to come to visit Gauri Das, he sat under the tamarind tree. Gauri Das asked for Mahaprabhu to stay permanently there in Ambika. In order to fulfill his devotee’s desire, Mahaprabhu revealed that his form and that of Nityananda Prabhu were in a nearby neem tree. It is also said that when these deities were being carved, Nityananda was physically present. Conquered by Gauri Das’s love for them, the deities would physically eat everything that he offered to them. These three, the name, the deity form and the original form of the Lord, are all one. No distinction should be made between them, for all three are of transcendental, spiritual substance. 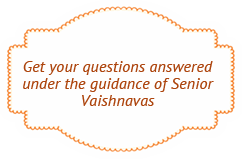 Jahnava Devi cried when she saw the samadhi tomb of her uncle in Vrindavan. Gauri Das Pandit Goswami disappeared in the month of Shravan on the sukla dvadasi, the twelfth day of the waxing moon.